PURPOSE: Stenting of benign colorectal conditions has been described, but its role has been limited due to technical issues and lack of long-term data on permanent metal stents for nonmalignant disease. However, with the recent introduction of nonmetal esophageal stents, there is a growing interest and some experience with their role in the treatment of benign conditions, including postoperative complications following esophageal or gastric surgery. In this paper, we describe the results of endoscopic stenting in 5 patients with postoperative anastomotic stricture following colorectal surgery. RESULTS: During October 1993 and August 2011, we have performed 147 stenting for colorectal stricture, including 102 cases of “bridge to surgery” stenting, 37 cases of palliative stricture relief, 6 cases of anastomotic stricture and 2 cases of inflammatory stricture. In total stenting cases, 136 cases (93%) could be successfully performed stenting. For the treatment of anastomotic stricture, 5 cases, that were all male with mean age of 67 and that showed no improvement by balloon dilation, were treated successfully by stenting. In these cases, stricture was immediately relieved after stenting. The insertion and efficacy rate was 100% in the 5 cases. There was no complication associated with stenting. Neither perforation nor additional surgical therapy was observed. All of these cases were undergone temporally stenting, which were removed later. Case 1 with wire guided (WG) stenting in the descending colon showed spontaneous passage of EMS in the 3rd month after the placement. 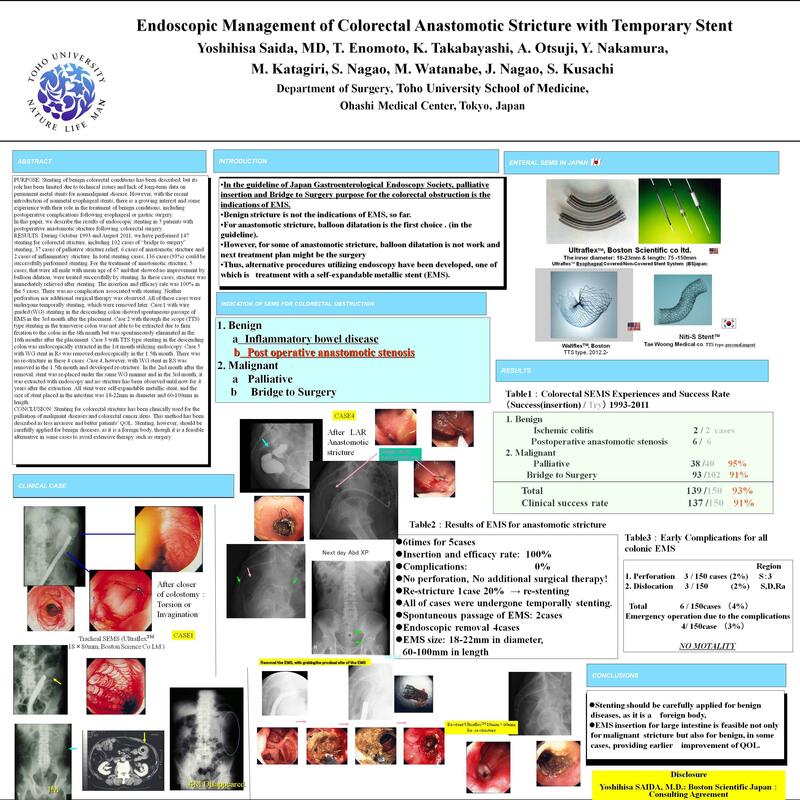 Case 2 with through the scope (TTS) type stenting in the transverse colon was not able to be extracted due to firm fixation to the colon in the 6th month but was spontaneously eliminated in the 16th months after the placement. Case 3 with TTS type stenting in the descending colon was endoscopically extracted in the 1st month utilizing endoscopy. Case 5 with WG stent in Rs was removed endoscopically in the 1.5th month. There was no re-stricture in these 4 cases. Case 4, however, with WG stent in RS was removed in the 1.5th month and developed re-stricture. In the 2nd month after the removal, stent was re-placed under the same WG manner and in the 3rd month, it was extracted with endoscopy and no stricture has been observed until now for 4 years after the extraction. All stent were self-expandable metallic stent, and the size of stent placed in the intestine was 18-22mm in diameter and 60-100mm in length. CONCLUSION: Stenting for colorectal stricture has been clinically used for the palliation of malignant diseases and colorectal cancer ileus. This method has been described as less invasive and better patients’ QOL. Stenting, however, should be carefully applied for benign diseases, as it is a foreign body, though it is a feasible alternative in some cases to avoid extensive therapy such as surgery.